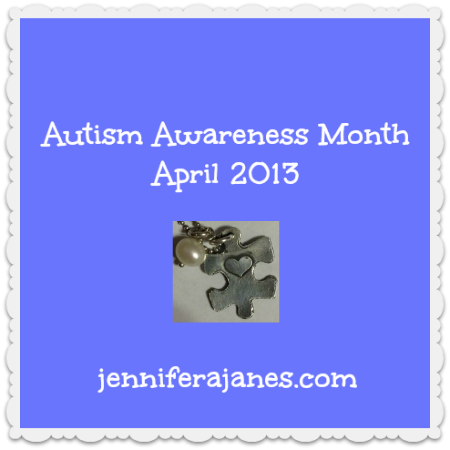 Because of our personal experience with autism and my desire to connect with and bless those affected by autism this month, I am dedicating the entire month of April to autism awareness. The Be Fully Persuaded series will be on hold until May, although I will try to write a weekly wrap-up post for those who like to stay informed about the details of our week, both personally and in our homeschool. This month will be full of reviews, giveaways, information, and guest posts related to autism awareness and products that will bless families of children with autism. Please enter the giveaways and help me share and promote these posts so that we can reach as many people as possible. I have personally contacted the companies and individuals involved in the giveaways and requested their donations. I am not getting paid to write any of these posts, although some of them might contain affiliate links, which means I get paid a few cents if you click through and purchase something. That money helps keep my site running. If that’s the case, it will be clearly indicated. Here’s a list of what you can expect this month. Some of the exact titles will change a little as I write and publish the posts, but I will edit them as needed and will add a link to each as it goes live. If you want one place to bookmark and come back to this month, this is it! You can also subscribe to receive my newsletter by email using the box just below the post. You will receive one daily email when I publish something new. On Saturdays, I’ll be sharing my notes from the Sensory Conference I attended in March. It’s fantastic information you won’t want to miss! I am writing some posts for other sites this month, and I will post a teaser to point you that direction when those posts are published. This 10-day series will run April 15-19 and 22-26. It will include some information about autism and posts by parents of children with autism, who have agreed to share what they have learned. Day 1: Autism is . . .
Day 4: Autism is . . . Sensational Adventure and Discovery in Motion! Day 9: Autism is . . . Not All About the Negative! There may be more coming! We’ll see how things go as the month progresses! Thank you for sharing on Twitter, Pinterest, Facebook, and Google +! I hope you will comment on the posts this month, share your ideas, suggestions, and stories, and be encouraged. You are not alone on this journey. Julie, my daughter’s OT diagnosed her with Sensory Processing Disorder, but I think it takes a psychiatrist, psychologist, or developmental pediatrician to diagnose autism. We went the mental health route, so our diagnosis was nailed down after a neuropsych evaluation with a psychologist and some visits with a psychiatrist. Your son’s pediatrician should be able to give you the referral you need to one of these specialists. I would make an appointment to express your concerns. My son was just diagnosed at age 7 by a neurologist. She gave me a test to fill out and bring back on follow up appointment. She scored it at follow up and said, yes.. Mild autism. I had been under the impression that he needed to be seen by a developmental pediatrician. I think there are several routes to getting a diagnosis. Since autism is a neurological disorder, I would think that a neurologist would be trained to recognize it. Many people do see a developmental pediatrician. We went the mental health route with a referral from my daughter’s pediatrician and ended up with a diagnosis after a visit with a therapist and psychiatrist and a thorough evaluation with a psychologist, who gave us several forms to fill out, probably similar to what you filled out for the neurologist. I can’t wait to hear you in Nashville at the teach them diligently conference! Thanks for hosting a great give away. We have an eight year old daughter on the spectrum and homeschool too. Hooray! I look forward to meeting you in Nashville, Amy! My daughter turned 8 today. We have a lot in common already.